You already have dinner started and realize you need to thicken your sauce but do not have the typical flour on hand to do the job. Pancake mix can be used as a substitute for thickening sauce, depending on the type of pancake mix you have and what type of sauce you are making. Pancake mix contains more than just flour, so adding it to your sauce could change the flavor or texture. A typical pancake mix contains flour, salt, sugar, baking soda and baking powder. Buttermilk pancake mix also has dried buttermilk among the usual ingredients. Other pancake mixes are made with whole wheat, which include added ingredients such as whole wheat, brown sugar, wheat germ and molasses. There are also pancake mixes that have bits of dried fruit or chocolate chips and even mixes that contain cornmeal. Some sauces do not need to be thickened with an external agent, such as tomato sauce. However, other sauces require a little something to help thicken it to a "sauce status." 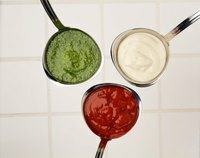 White sauces, typically made from milk or cream, often need a thickening agent to get it to the desired creamy consistency. Gravies or sauces that do not have a milk or cream base, such as wine or stock, benefit greatly from a thickening agent, since the base is usually too thin. Meals like stew also gain from having a thickener added. When using a pancake mix to thicken your sauce, it is best to use a general mix without added ingredients. A close second is buttermilk pancake mix, although buttermilk may add a slight tangy flavor. Whole-wheat pancake mixes could alter the taste of your sauce, since whole wheat is a heavier flour; this type of pancake mix could lend a deeper flavor to a hearty stew, but it may also add graininess to your meal. You can use pancake mixes with bits of fruit or chocolate chips if you want them added to your sauce, or if you have the time and desire to pick them out. Cornmeal mixes could add a gritty texture to your sauce. To use pancake mix to thicken your sauce, the best method is to make a slurry. Start with 1 tablespoon of pancake mix and add just enough cold water to make it a batter consistency. Stir the slurry into your sauce. If the sauce is not as thick as you would like, repeat this procedure with another tablespoon of pancake mix. Adding more than 2 tablespoons may have adverse effects, such as adding a floury or pancake taste to your end product. While pancake mix is good to use in a pinch, other flours and starches are a better alternative for thickening sauces. Potato flour is a gluten-free alternative to all-purpose flour and can be added to sauces in the same manner as regular flour. Bean flours can also be used, but they tend to have a nutty flavor. Starches such as corn, potato, tapioca and arrowroot are best made into a slurry for adding to sauces. Other unconventional ideas for thickening sauces are pumpkin puree, vegetable purees, pureed chickpeas or white beans or soaked, blended cashews. Fresh Fork Market: Get Sauced!